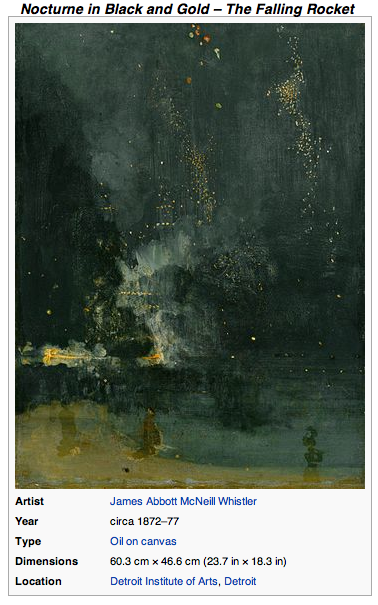 This entry was posted in art, art education, art museums, creativity, drawing, inspiration, Painting, Uncategorized and tagged Art, James Abbot McNeill Whistler, James Abbott McNeill Whistler, Nocturne, Paint, Whistler, Whistler's Mother. Bookmark the permalink. 😆 😆 That movie was hilarious! The professor also had to chuckle when you mentioned the snobby accent in the beginning! Why is it that people think you are more intelligent if you have a snobby accent? I don’t know! It annoys the professor, though. Isn’t it vexing to hear? Loved the Mr. Bean clip! Thank you!! I actually read your post a few weeks ago!! I loved it and must read it again! funnily enough, I enjoyed reading it again and thought it was quite amusing…I guess I’m a sucker for my own writing. Actually, it was a propos at the moment since I have been struggling to finish a woven vessel and waiting for the muses to tell me what to do. Some artists are both writer and painter. Verbalization isn’t compulsory though if he/she is a writer he/she can interpret what he draws not to allow misinterpretations. Eventually his/her interpretations are just illusions and visions. This article is very good and articulates the world of the artists in its broad sense. You are right! Interpretations do become illusions! Thanks!! !